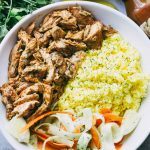 Pulled Tandoori Chicken Rice Bowls – Deliciously juicy chicken breasts cooked in tandoori marinade and served over flavorful lemon rice and a cucumber salad. 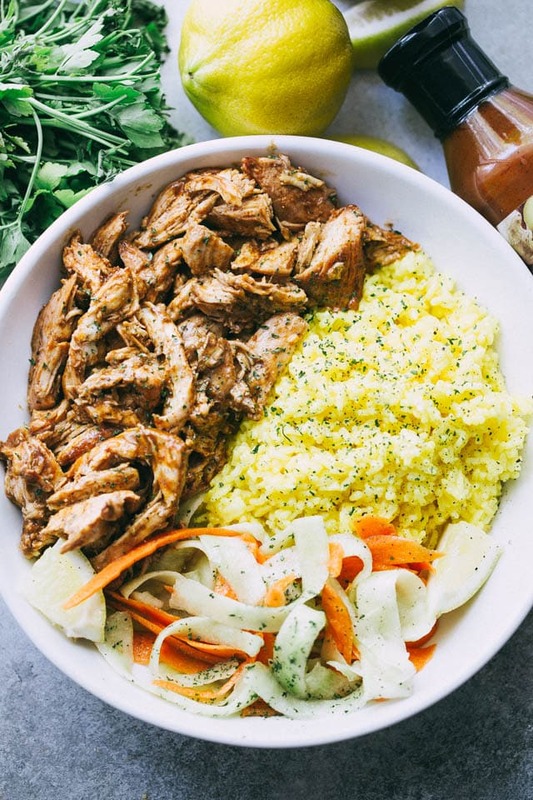 Close-up and in our face: PULLED Tandoori Chicken Rice Bowls! I know, so many things, flavors, and textures going on, but wait until you try it – you’ll be SO glad you did. By the way, HELLO, dear friends! Happy Monday! Hope it’s a great start to the week for you, but please, don’t Monday too hard because I have tonight’s dinner for you, all written up and ready to be printed and shopped for. You guys, this is possibly my new favorite way to make pulled chicken. As evidenced by recipes like my Lemongrass Grilled Chicken, I love love love marinades/sauces that come in these beautiful bottles by Private Selection. The number one thing I love about this recipe? 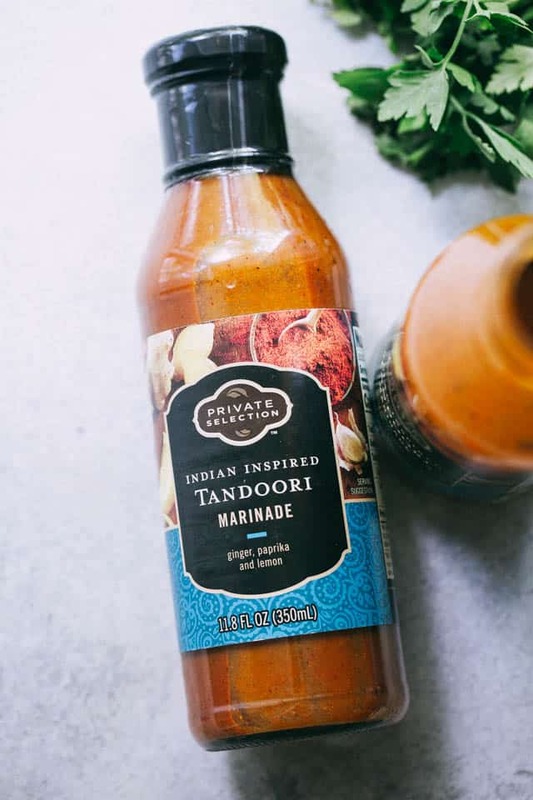 The Indian Inspired Tandoori Marinade by Private Selection, of course. With their focus on unique, yet approachable products, this marinade, while different and maybe intimidating for some, Private Selection has made it suuuuuper easy for all of us to give it a GO and love it! AND, thanks to the passionate foodies over at Private Selection for all the gourmet marinades and artisan foods, now we can all be what we clearly are: experienced and cultured. But seriously, the five minute thing? You do need a bit of planning ahead because it marinates for a couple of hours, but just try to find something as delicious and as simple to prepare like THIS tandoori chicken that makes you look and sound like a worldly chef. Ya can’t! These tender, juicy, flavor-pumpin’ chicken pieces are marinated and cooked in the tandoori marinade, and before the fork action starts, we are going to prepare some of my amazing Lemon Rice, and a simple side of cucumbers and carrots salad to go with all of it. However, even if you are too busy for the rice and the salad, have no fear, pulled chicken and hamburger buns are near! Just pull the chicken apart with two forks, stick it in between the buns OR in a tortilla wrap and have a go at it. It’s just as delicious. 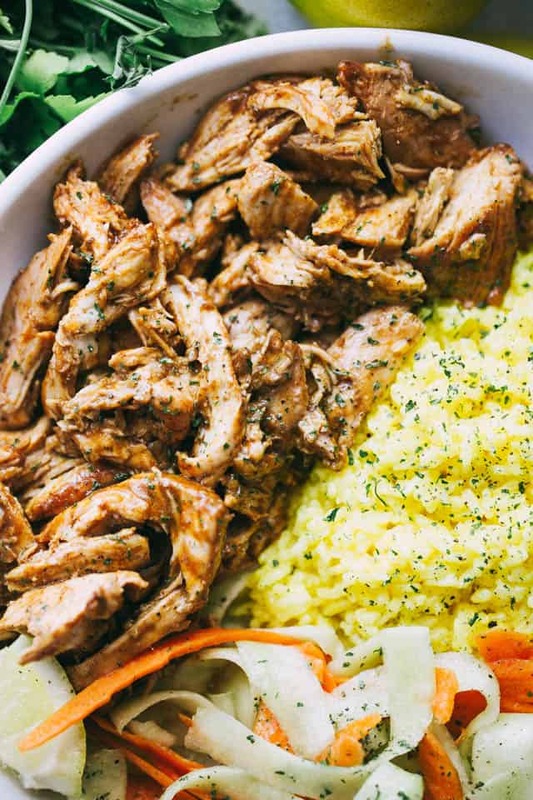 For those that do have a moment to spare, don’t skip the rice – it’s so, so wonderful, and it goes quite perfectly with all the flavors of the chicken. 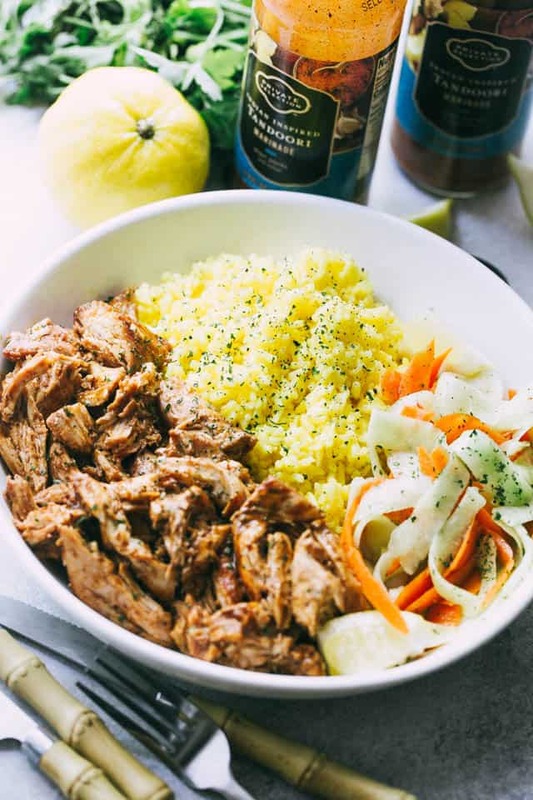 Best part about all this is that the pulled tandoori chicken makes for a great getting-ready-for-the-week recipe that you can keep in the fridge to toss in salads, wraps, noodles and, of course, rice. My husband finished up that WHOLE bowl… THAT was supposed to feed at least 2 adults. 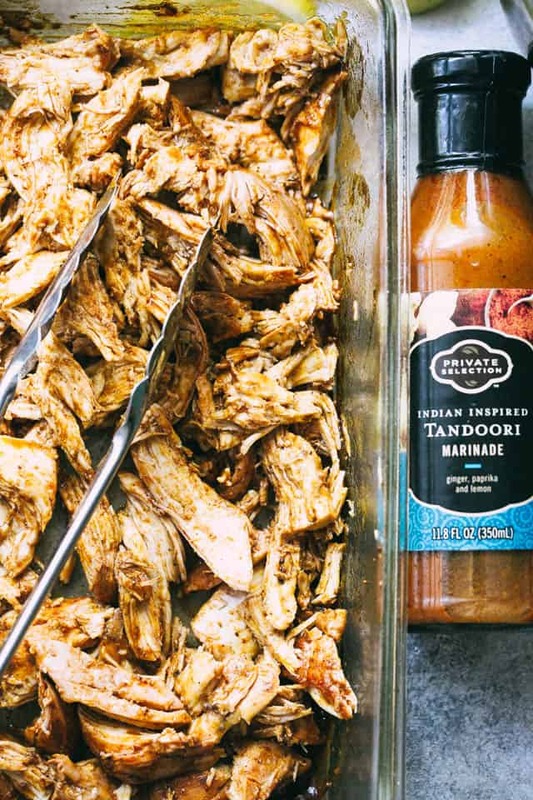 So, yeah, take his word for it and pick up a bottle of Private Selection’s Indian Inspired Tandoori Marinade so you can make this wonderful chicken dinner as soon as possible. Deliciously juicy chicken breasts cooked in tandoori marinade and served over flavorful lemon rice and a cucumber salad. 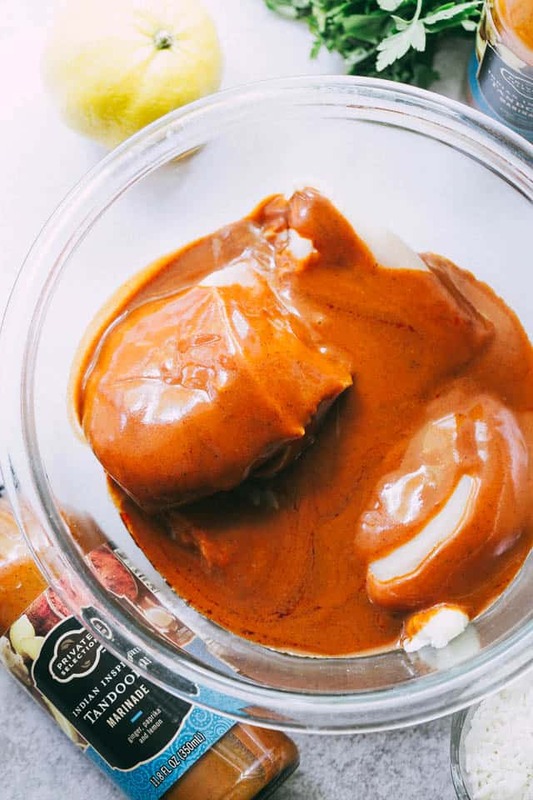 Combine chicken and marinade in a sealable ziploc bag and refrigerate for 2 hours. 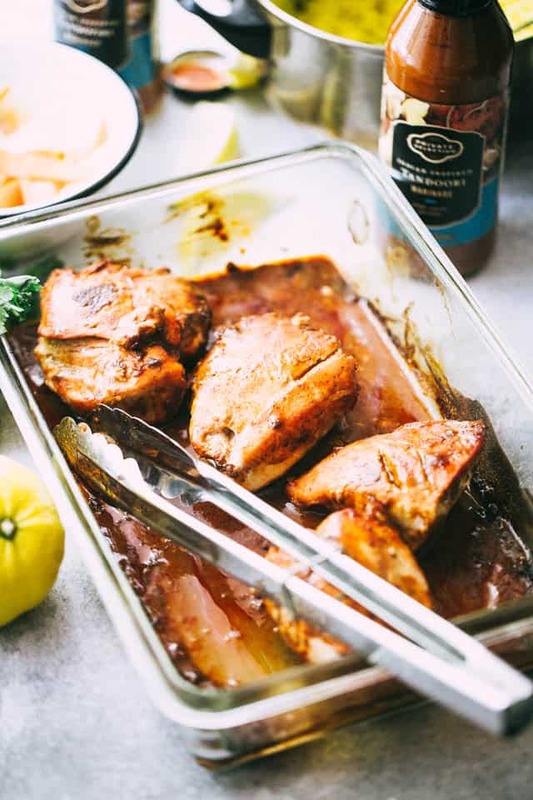 Transfer chicken and marinade to a glass baking dish. Bake for 35 to 40 minutes, or until internal temperature of chicken reaches 165F. Remove from oven and shred it. Set aside. Combine prepared rice, lemon zest, lemon juice, turmeric powder, salt, and pepper in a bowl; mix until thoroughly combined. Set aside. Combine cucumbers, carrots, lemon juice, salt, and pepper in a bowl; mix until well combined. Transfer prepared lemon rice to 4 bowls. Layer the chicken and salad over the rice. This looks like an easy healthy dinner. Can’t wait to try. I can just see the delicious flavor!! YUM! Kate, this looks seriously amazing. I could eat this all the live long day. The flavor factor is awesome! Totally calling my name! That chicken looks super flavorful! I need to try this asap! I almost didn’t give this recipe a click. I thought Tandoori–too involved for me! So happy to see it is an easy recipe with a marinade I can find at a store I already shop! Yay! Thank you! I love tandoori chicken! This looks like a yummy dish. wonderful recipe, thank you, love the tandoori marinade, different yet familiar! Familiar from menu orders, different from everything else in my recipe box! My boys (and me) will love this! Great for dinner! I am all about kitchen shortcuts, especially in the summer months. This looks fabulous! That marinade looks amazing!! It is going on the grocery list! Indian food is our most FAVORITE over here. And bowls meals are ALWAYS a good life decision..these are definitely happening this week! Pinned! I wish that I had one of these for lunch today!